It comes down to today’s game. The Mets need one more win to lock up the first Wild Card spot and home field advantage. The Mets performance over the past month has been incredible. Sure the schedule has been soft overall, but they beat the Cardinals and Giants down the stretch. They deserve praise for this improbable run. If the Mets make the one game Wild Card playoff and lose, it’ll leave a sour disappointing taste in our mouths for 2016. As I’ve said many times, I barely consider the Wild Card game a playoff game. But the bottom line is the Mets deserve praise for waking the hell up a month ago and getting to this point. The Mets won last night because of Robert Bruceman (i.e. 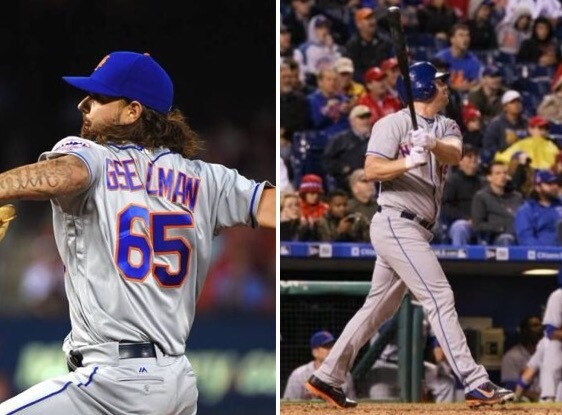 the combined stellar pitching performance from Robert Gsellman and the three hit, three RBI night from smoking hot Jay Bruce). Robert Bruceman sounds like a swarmy classless business man that would pick up a woman in a hotel bar, accompany her to her room, and then disappear the next morning leaving her with an enormous room service bill. The Bruce Is Beyond Loose: Jay Bruce hit an RBI single in the 4th inning, a solo homer in the 7th inning, and an RBI single in the 8th inning. Streaky players are completely ridiculous. He went from completely lost at the plate to absolutely en fuego. T.J. Rivera also added a 4th inning RBI single, and Yoenis Cespedes had an RBI in the 8th on one of the most absurd pop force outs to first base that I’ve even seen. God I hope this team clinches today and wins the damn Wild Card game. Bruce is hot. The offense is hot. Please just give these bats a chance in a short playoff series. Also, after all the struggles we had on offense this season I can’t believe I just typed that sentence. Trust Issues: Robert Gsellman gave up 7 hits and 1 run over 6 innings. He struck out 7. Is it weird that I don’t trust him? He’s been spectacular. ERA under 3. He’s firing off quality start after quality start. And I just don’t trust him. I’m expecting him to turn into a pumpkin despite the fact that he’s always been a promising minor league arm, and he’s showing his talent at the major league level. I suppose the skepticism has more to do with being a Mets fan than anything else. We’re always doubting the validity of every good thing. We just sit around waiting to be burned. Trust Issues 2.0: Speaking of skepticism, the Fernando Salas, Addison Reed, Jeurys Familia combination struck out 7 Phillies over 3 innings. The back end of the pen has been logging so many innings, but it’s remained dominant. Terry used all the big guns again last night because he’s trying to lock this damn Wild Card spot up. I get it. But I’m skeptical yet again. I’m waiting for their arms to fall off when it matters most. Reliever trust issues also come with the territory when it comes to being a Mets fan. All teams really. Cancel The Game: Terry Collins said after the game that he’d consider starting Eric Campbell at first base if the Mets make the Wild Card game and face Madison Bumgarner. If that’s the case just cancel the game now. I’d rather start any left-handed hitter on our 40 man roster in that game over Soup. Soup stinks. I’m just going to assume Terry had a moment of temporary insanity after the game when he said that. Please God no Soup. Also, the Mets confirmed after last night’s game that Wilmer Flores tried to swing and failed. He’s out forever. It’s a huge blow. It’s the reason we’re talking about Soup and playoffs in the same sentence. I’ll never forgive Terry for that pinch running oversight that led to Wilmer’s home plate collision if it means we see Soup hitting in a big spot. Today: Clinch today baby! Let’s go Mets!